Ashley was awesome! Thy delivered a day early so that I didn't have to stress on the morning of the wedding! They were kind and efficient. They did a wonderful job and I would definitely recommend! Tables looked beautiful!! Super easy to work with, would definitely recommend! Puget Sound Farm Tables was wonderful to work with! They were incredibly prompt with their responses and accommodated our needs flawlessly. The tables themselves pulled our entire wedding look together and we couldn't have found better if we tried. Thank you so much for everything! We've already had people ask where we sourced our tables from so we hope we'll be able to send some new customers your way! Ashley and Clint of Puget Sound Farm Tables are wonderful! Communication was easy, payment was straightforward, and the tables were absolutely beautiful! We received so many compliments on the tables. They are very sturdy, comfortably seat 12 people, and were a perfect backdrop to our modern table settings. Plus, they make setting the tables much easier since you do not have as many linens to steam/iron to cover plastic or unattractive tables. Delivery and set-up were quick and they even picked the tables up early the following morning, even before we woke up! 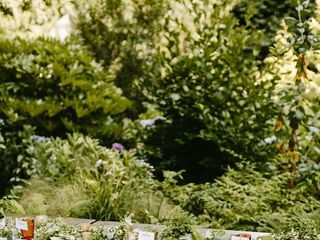 We definitely recommend Puget Sound Farm Tables! We rented from for a 40th birthday and they were great! They were quick to respond to email and were accommodating for the set up time. I was very impressed with how smooth it went. They have a lot of inventory and options for parties and weddings. I would highly recommend them and we will definitely use them again. Very professional, arrived on time, tables were beautiful and they even buffed them to a shine after set-up. Ashley and Cling are so easy and wonderful to work with!!! The tables and benches are absolutely gorgeous! Absolutely the best company to work with! 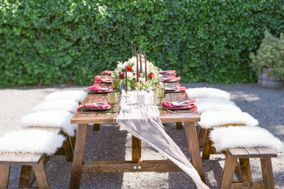 Their farm tables are stunning and made such an enormous impact on my reception. Also Clint and Ashley are amazing vendors to work with, quick with responses and questions! You are in great hands with this company. We loved the farm style benches and self serve beer bar. Our guests couldn't stop talking about how cool the experience was. Ashley and Clint were so flexible and helpful, even giving us a beer tapping lesson so our big day went off without a hitch!!! Thank you! We had several farm tables and wine barrels for our wedding. They showed up exactly when they were scheduled and looked AMAZING. My client wanted wood, rustic tables to match the outdoors theme of her winery wedding. Puget Sound Farm Tables was not only very easy to work with, but the tables exceeded expectations. The tables were excellent quality and everyone commented on how beautiful the tables were. We booked 11 tables with Puget Sound Farm Tables within weeks of our wedding, cutting it close. Clinton and Ashley were incredibly friendly and communicative throughout the whole process, helping ease the stress of planning and coordinating on such short notice. + They even included the 11th table and free delivery and setup because we requested 10 tables. + They even came by at midnight to disassemble and pick up the tables, and didn't charge us for the late-night services, which was a rare commodity with wedding vendors. The tables are absolutely beautiful and worked with our wedding perfectly. + The tables were waxed on site, even though they already looked flawless. These guys truly care. + They even offered a canopy stand when it looked like folks might get rained on. Your search should start and end here - Puget Sound Farm Tables are the only table rental company to look at. Period. Absolutely gorgeous tables, made the venue and gave the ambiance we were looking for. Could not have been happier. Clinton and Ashley were wonderful to work with. Highly recommend!!! 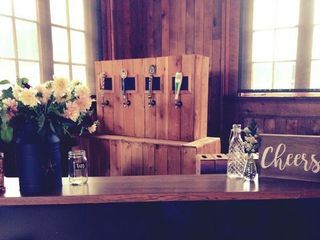 We rented a beer bar from Puget Sound Farm tables and were very happy with them! Overall a great rental experience for my daughters baby shower. Table was a blessing as the whole group of ladies were able to sit and engage in conversation. Thank you! We were extremely happy with the farm tables we rented for our wedding! They were quite the statement for our head tables! Working with this company was equally a great experience and I'd recommend them to anyone! 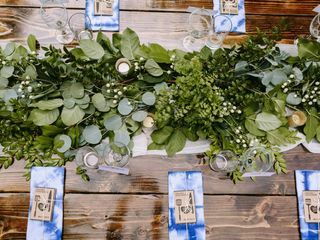 We absolutely loved using the farm tables at our wedding in summer of 2017. 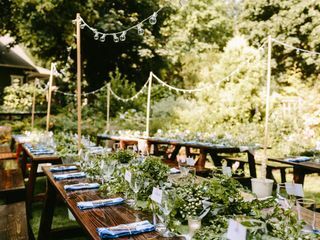 We had a backyard wedding and the tables really pulled the bohemian decor theme together for us. The tables are a bit more expensive than regular event rental tables (eww! ), but they become part of the decor of your wedding and the stand out as statement pieces. 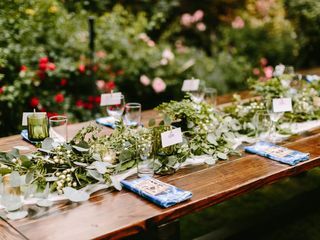 The cost is justified because you don't need to spend money on fancy centerpieces, like traditional event tables and no need for table linens. Tablecloths are for grandmas anyways! Ashley and Clint were also professional and super easy to communicate with. Only recommendation would be to make sure you allow for extra time at your venue for table set up and disassembling. We'd love to find and excuse to use them again.